The creator of this list is diamond so there may be some personal bias towards higher tier play on certain champions. With enough playtime, a high win rate on a champion indicates *something* generally goes right, and a low win rate indicates that whatever is happening in games with this champion isn't in their favor. A low win rate may mean a champion is being played incorrectly and is stronger than his win rate indicates, but a top 25 win rate (with 120 champions) almost always indicates that a champion is at least a good candidate for Tier 1 or high Tier 2 if the sample size is large enough. This means that champions with high win rates doesn't mean that they're necessarily GOOD right now, especially if they have a low playrate or tend to get into favorable match-ups. If we feel this is the case, these champions will place differently on this tier list than you'd think. Similarly, champions with low win rates that are still within the acceptable deviations may end up slightly higher than you'd expect from a champion with mediocre win rates. If there are champions on this tier list with low overall play rates but good win rates after relatively few games of practice, it may mean that players that pick those champions up just to try them are bringing down the average. If this is the case, we will place them higher on the list. More thoughts on win rates here. In Tier 3 of this tier list, we've placed certain champions that are good as a second pick, but can get spanked hard if they end up first picking by a variety of meta champions. If you're good at a large variety of champions, picking a champion that counters your laner is a good place to start. If you can get a slight advantage and don't have a clear experience advantage, picking a champion that both places high on this tier list and also counters your enemy laner may give you enough to win a game. As far as marksmen go, Draven's not a hard marksman, he's just a different marksman. Despite this, the mechanics behind him are not terribly difficult, and no other marksman has the ability to run down teams and pub-stomp quite as hard as him. He punishes mistakes incredibly hard, and the only thing keeping him out of God Tier in this list is indeed the fact that you need to learn a completely new skill set. Top lane Hecarim certainly deserves his place on his list. 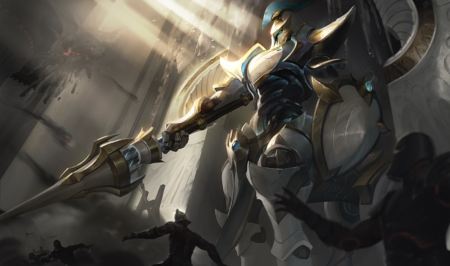 With no nerfs in sight for Patch 9.8, expect him to continue dominating top lane with his ridiculous damage boost courtesy of Riot. In lane, he out-trades nearly everyone, and fighting against him is near impossible. Later in the game, players are treated to the enjoyment of a Hecarim that's impossible to outrun or kill in his current status. After several patches of continuous mediocrity, Kai'Sa is now slightly stronger as a result of Blade of the Ruined King nerfs coupled with Stormrazor buffs. By nerfing the items of her rivals and buffing her main build, Kai'Sa is now able to contest the mid-game again. Her laning phase was never that bad, but her scaling wasn't quite as good as most other marksmen. After further nerfs to Kayle's scaling, it ends up as a strong multiplicative nerf simply because of the way her build and skills stack on each other. As a result, she's finally at a decent spot where she feels fair to play, but can't feed early game and 1v9 late game. The addition of ghosting for his ultimate doesn't look like too much at first glance, and it may not end up making much of a difference in most cases. On the other hand, it's definitely a buff and allows Master Yi to avoid crowd-control skill shots by weaving in and out of minions. This adds an extra defensive dimension to his play, although most minions will likely die to his Alpha Strike. Most players are still sleeping heavily on Morgana mid. Hextech GLP gives her extremely high map pressure, and her ability to catch and kill enemy champions remains high. Her laning phase is also very safe as a result of her long-range waveclear and black shield, and late game she remains one of the top utility laners for the same reason. She doesn't have the sustained damage that most mid-laners try to provide, but in an age of hyper carries one catch is enough. If players are sleeping heavily on Morgana mid, they're absolutely comatose when it comes to Nocturne mid. He's been Tier 1 on this tier list for a while, and it's no mistake given his powerful roaming potential and simple to execute strategy. His ultimate is also much more reliable to gank with than similar ultimates like Twisted Fate's. In the jungle Rek'Sai still remains top on the tier list. Her sustain is outrageous, her damage is absurd, and her finishing move is almost literally unavoidable. Her gank angles are immense and almost always successful, and the amount of mobility she has once she gets going makes her impossible to deal with. Even in Patch 9.7, high-level Renekton players are doing fine on him after getting the hang of him and understanding his damage output. The buffs on Patch 9.8 to this big boy simply put him in an even better spot than before. His healing now makes him incredibly good in team fights, and his attack speed growth allows him to split-push even harder than before. After some initial hype on Sona as a marksman, we're dropping her down a bit this tier list. She's good, but a bit difficult to play as in solo queue. It's not easy to survive as Sona when the enemy team is gunning for you, and she honestly needs good support to survive and be useful. She's good at peeling, but not when the enemy team is aiming for her as a top priority. Taliyah in her current form is definitely seeing some resurgence after continuous nerfs on other popular mid laners over time. Her burst damage is now very comparable to her rivals, and her roaming power is still as strong as ever before. The nerf to Zed's Razor Shuriken [Q] is really a double-whammy on his damage. First, it reduces his poke damage and wave clear early game, then it also reduces the multiplicative stacking on his Q damage when synergized with his ultimate. When you couple that on top of the potential reduction in his Q damage from multiple shadow clones, you start to realize that 10 damage starts adding up over the course of the game. Of course, that's not enough to stop him completely, but it's enough to drop him out of God Tier. For a list of champions with the highest *potential* in the game without regard to difficulty or team synergies, jump to the strongest potential champions in each position! Be sure to visit Optimal Champion Bans by Division too!